The current travails of Qantas, the Australian carrier, will have sent a further chill down executive spines. Traditionally, governments have sought to maintain their flag-carrier airlines: Australia’s Qantas Sale Act prevents it falling into foreign ownership. But can the current state of affairs continue? Qantas, like all airlines, has seen its fuel bills balloon. Escalating oil prices mean fuel now represents on average a third of airline operating costs, from about 13% a decade ago, according to Tyler, putting profits were “on a knife edge”. 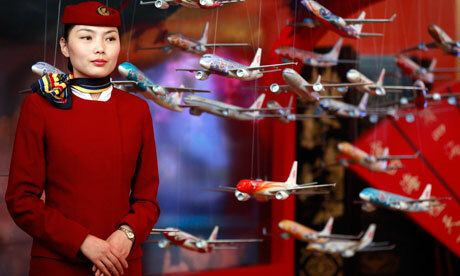 Globally, Iata forecasts $3bn profits this year for the entire industry, on revenues of more than $600bn. Even those razor-thin margins are down to a handful of major carriers that continue to boom in China and the Asia-Pacific countries. Christoph Franz, the chief executive of the German carrier Lufthansa, which has swallowed up both the Swiss and Austrian national carriers in the last five years, is equally adamant that other airlines need to go. “We have 50 airlines in Europe. In America you have six [major network carriers].” Competition rules, he says, will exacerbate company failures. “In the last decade it was acquisition and mergers. Now, with BMI, you see you have to provide expensive remedies and give up slots” to acquire rivals – in this case, a dozen prized landing slots at Heathrow. According to Franz, “it means the smaller airlines can’t be bought – only go bankrupt. The current competition regime is triggering consolidation through bankruptcies.” Carriers that traditionally applied for state aid no longer can, he says, “and if they don’t get it, it’s very difficult”. Posted: Sunday, June 17th, 2012. Filed in General News, Recent News.